*This is part of a series on my journey to get a 760. Part 1, Part 2 & Part 3 can be found here. With less than one left, I have ramped up my study schedule to 20 hours+. I have been trying to follow my rigorous schedule, I have been using The Economist’s GMAT Tutor and I am about 88% completed. Right now, I have logged about 104 hours (well short of my goal of 150 hours, unfortunately). I am hoping to log another 16 hours before my test on August 23, 2014. 730. I took my second practice test and got a 730 (Q49, V40)! I am a little disappointed. With my huge focus on Verbal, I expected a raw score of 44 or 45. However, I am still pleased (even if my score isn’t as high as I would like). Sentence Correction killed me. Out of the 11 questions I missed, 7 of the incorrect answers were on Sentence Correction. I’m speechless. Now, my focus will be continued concentration on Sentence Correction. I will be spending more time per question on incorrect questions while I review. It is imperative that I understand why I am answering those questions incorrectly, as well as internalizing the lessons learned in time for my test. I will be utilizing Magoosh’s great question bank and video explanations to get me there. I also purchased the new OG GMAT 2015 (check out my top 6 key resources for the GMAT post)!!!! 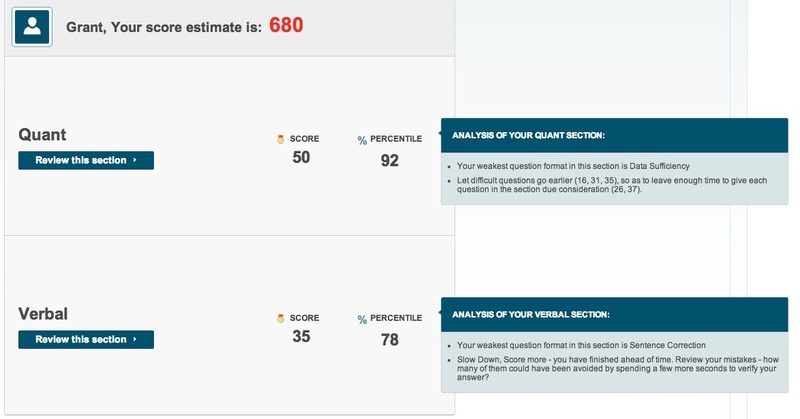 730 is still an excellent score but I’m sure you can hit your target of 760. Your systematic method of preparation is literally putting me to shame at the moment, since my own preparation was all over the place. It will definitely pay off for you though!